The Plasticade products are durable 100% plastic products that will not rust, splinter, or ever need painting and this is a great place to get them at very reasonable prices. The Signicade Deluxe is 27"x45" and it has a 24"x36" sign area. You can easily display a sign on EACH SIDE of the stand. Available in black or white. The molded handle provides easy portability. These stands can be internally weighted down with sand. 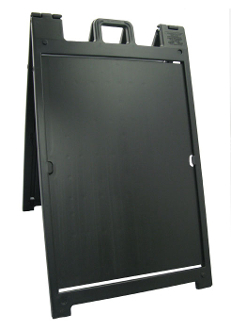 The stand has a "lift up, drop in" feature and requires no hardware to add your RIGID sign panel. The "lift up, drop in" feature is the key feature that makes this stand different than our "regular" signicade sign stands. You can add internal weight to the stand (if needed). You should only put 5 lbs (or about a gallon) in each side. That comes to about 6 inches in the bottom of each side. You will NOT want to fill them up all the way to the top with sand or they will bend.